I very much liked the last statement – it captures well my own expression of the specialness of boundaries and edges. There was a bunch of interesting stuff on gestalt psychology vs systems theory which I will leave to my notebook. The next topic, on experimental systems was also fascinating – with a really interesting depiction of how unpredicted events create new forms and allow your research to develop. A graphical view of serendipity perhaps? How do you stabilise these unknown objects and turn them into a new form? This is perhaps a way into exploring my idea (newly articulated) as a capture of experiential moments. Exploiting and encouraging serendipity, looking at how the random elements in the forms change what you have created and, perhaps most difficult of all, embracing the unknown. This entry was posted in 03.4 Tutorials and seminars and tagged artistic research, serendipity on 5 February,2015 by antalbot. I am a strong believer in the power of serendipity. I used to give lots of talks and lectures on the principles of innovation, and one of the top tips was to create situations for yourself in which serendipity can happen. You can’t force coincidences of course, but you can be the right place, or with the right people, or critically you can have the right mindset, for the magic moments to work. It was with this mind that I casually strolled onto the south bank yesterday, killing time and looking for a cup of tea when I stumbled upon a rather striking exhibition just opened at the Hayward. I really like the Hayward Galley; it always has really interesting stuff on and seems to be one of the more approachable galleries for the ‘man on the street’. I do seem to have a liking for their big, unusual installations. I think perhaps they feel more engaging, more real to me than stuff like paintings – which just make think of men in tweed coats drinking Port and discussing the merits of Picasso. I really do have some issues over school art education!! 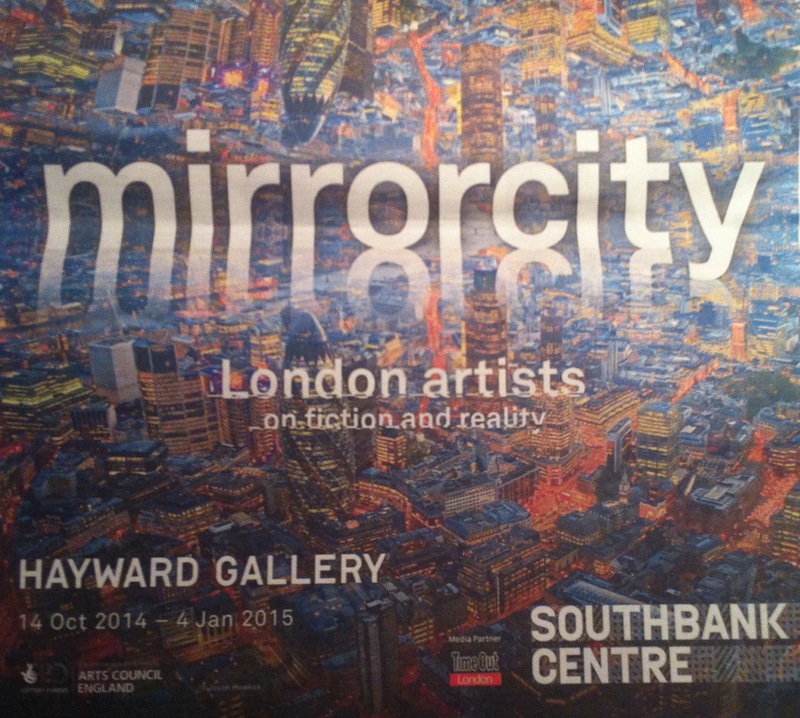 Anyhow, this exhibition was MIRRORCITY which was badged as from ‘fiction to reality’. With my research question practically in the exhibition title, I just had to drop in! I thought it was a great exhibition. I think I will need to go back and look at it again, to be able to take it all in. What struck me? Well, the feeling of alternate perceptions, realities a little strange and in some cases just bizzare. They sucked you in and made you want to look – that’s the power of a good installation. — Lindsay Seers – wow, her video installation was so captivating I could have watched it all the way through a second time. She was looking at the presence of the past as a alternate reality, lost histories, how in the current age our emotions and feelings are stored online in public view in perpetuity. Just one text message could alter the course of history. Just brilliant. — Mohammed Qasim Ashfaq – work in blackness, sheer and shiny – where precision and simplicity give an otherworldly presence. Meditations on light and it’s absence. I need to look up more of his work, I loved the effects as they captured some of the feelings I want to in my own proposal. — Emma McNally – maps which are not quite maps, and look so detailed and so precise, but all come from her imagination. — Ursula Major – also interesting, I really liked her mix of 3d objects plus interacting videos which cut out and changed a random points. She also had a projection which looked something like evolving coloured fog. Creepy but enticing – I am keen to use this type of effect. Didn’t quit get the 3d objects so well though, mostly as I had no idea what they were. — Susan Hiller – brain numbing video installation. Not sure I quite understood anything, but it felt like being in an episode of the outer limits. Weird and amazing. 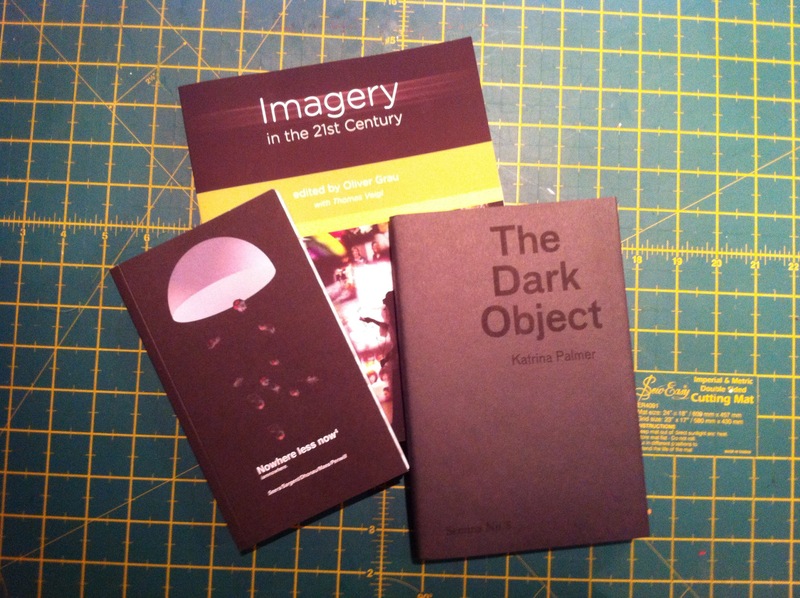 Also picked up some very interesting books (photo below). A reminder to self, I must ask Maiko if I would be allowed to have a tutorial with Jonathan K, to ask about guidance on incorporating digital imagery my work. 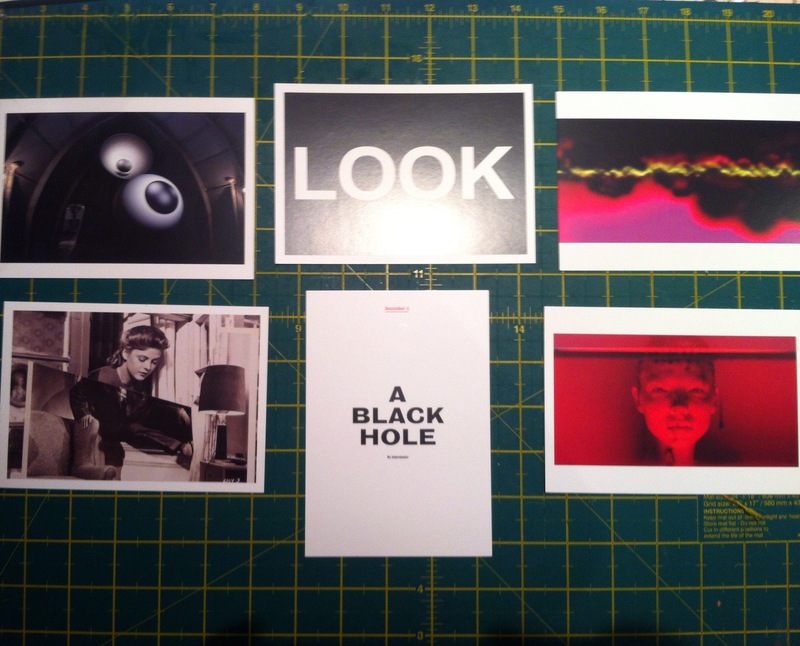 This entry was posted in 03.3 MA Project proposal, 04.2 Exhibitions and tagged Hayward gallery, mirrorcity, reality, serendipity on 17 October,2014 by antalbot.